I am always so excited this time of year. I pour through the endless stacks of seed catalogs, looking for those things I love to grow, looking for the things everyone else wants me to grow too. 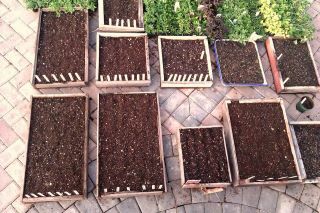 I plan and prepare veggie beds making sure every square inch is accounted for. I lay out spreadsheets of veggies, timing each one diligently so we all can eat a variety of goodies throughout the year. And I start my seeds, giving delicate attention to their every need to grow up big and strong. The pressure can be intense, there is so much to do. The distinct oder of cooking compost for seed beds captures my attention, the steam rising warms my mood. Spring is near. I love to just run my fingers through the soil, I do this often, just to “mix it up.” Really, I do it because it feels so nice. I immediately surrender all tension in my neck and shoulders. My mind clears the clutter, the nagging to do’s, those little nibblers that taunt me. I am wearing the earth and I feel serene. My mental spa is the earth. I love this time of year! I love the term “dirt therapy”! So true! Thank you Tammy, I thought I already posted.